The Man With the Golden Gun got it done. Ask someone to pick their favorite Christopher Lee role and they’ll give one of four answers — Dracula, Scaramanga, Saruman or Count Dooku. Talking to friends today, when we learned that Lee died at the age of 93, it tended to break down by age group — 50s and older, it’s Dracula; 40s it’s Scaramanga; 30s, it’s Saruman; and younger than that it’s Dooku. Of course, this isn’t absolute (and besides, only a Sith believes in absolutes). No matter the choice, however, it’s a testament to Christopher Lee‘s longevity and popularity that he could feast on four defining roles over decades of darkly menacing performances. I happen to be in that 40s group, for what it’s worth: The Man With the Golden Gun was my first Bond movie. My father took me to see it in the theater and I wasn’t quite sure what to expect. I was a Batman kid and at 7 or 8, I didn’t quite grasp going in that a guy with a handgun could be the hero. But I was utterly transported by that movie and, though I didn’t realize it at the time, it was a life-changing moment. I was now a James Bond fan and I have been a devotee ever since. 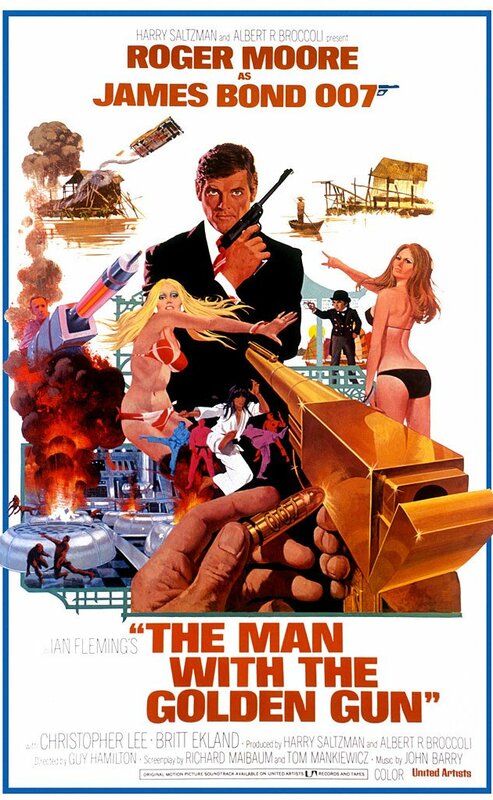 The Man With the Golden Gun gets a bad rap. It’s frequently on Worst Bond Films lists for its often broad, cringe-worthy camp. I don’t care. I still love it (another tendency: you always love your first) despite its glaring shortcomings. 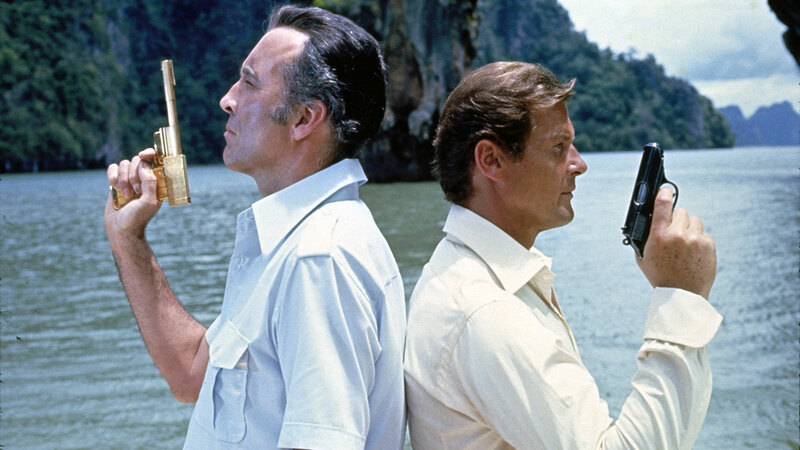 Scaramanga, the Man With the Golden Gun. Christopher Lee was as suave as Roger Moore‘s James Bond, with a knowing sense of humor and air of danger. The scene where he quietly takes out his pen and lighter and starts casually constructing his golden, single-bullet gun — and kills Hai Fat — is one of the great coolly badass moments in Bond lore. It’s not quite Goldfinger‘s “No, Mr. Bond, I expect you to die!” but it’s up there. And when he blows up Bond‘s plane with the Solex-powered laser? Outstanding. And when all hell breaks loose with Miss Goodnight running around in her teeny-weeny bikini, Bond getting hunted through Scaramanga‘s weirdo shooting-gallery fun-house obstacle course, and the island hideaway getting blown to smithereens? Even more outstanding. From that point forward, I was hard-wired for Bond. No disrespect intended to Sir Roger Moore — for whom I will always have a certain affection — but it took me some years to unlearn his Bond and find out that he wasn’t exactly the definitive 007. 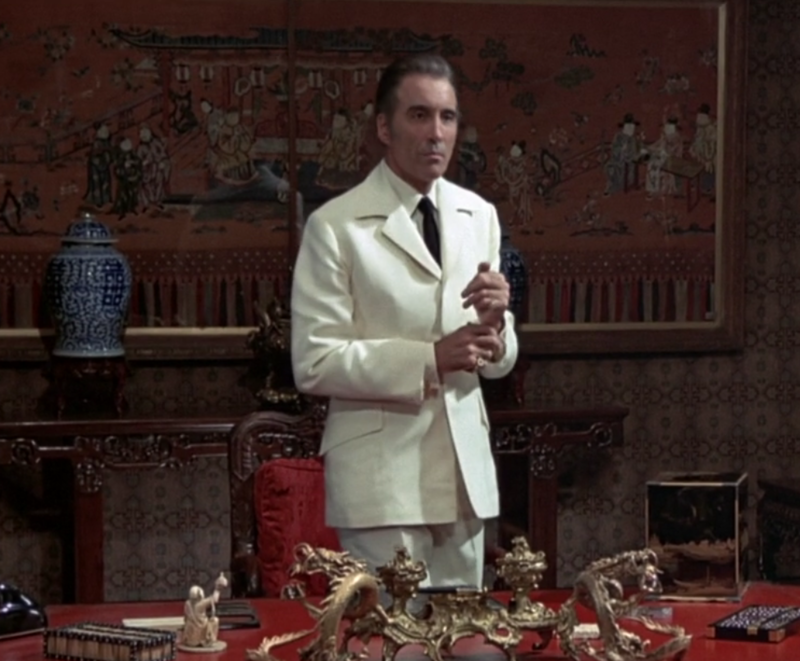 But I never unlearned that Scaramanga was one of Bond‘s greatest villains. Because Sir Christopher Lee stands tall in his ’70s white suit, smartly smoothing over his film’s shortcomings — and taking his rightful place among the very best of Bond‘s bad guys.